Nice, thanks! I should have asked sooner!! Applestar, Thanks for getting back on the Cauliflower and Broccoli plantings. I plan to put cover over them to try and avoid the dreaded caterpillars as well. If I read the threads correctly, your cauliflower did pretty well with the April planting. I have two Spring transplants planned for April 17th and the 25th so I'll continue along with the plan. I'm planting Snow Crown as well. I hope to get a couple succession plantings in for the fall but will be planting Amazing and a purple one. I have transplants scheduled every two weeks from June through July. The purple is supposed to have lots of vitamins in it so it will be interesting to see how it tastes if we get it growing. I hope to get the broccoli out by mid March so it will hopefully not bolt like it did on us last year. We love both veggies and really would like to get them fresh from our own garden! Once we get going, I'll let you know how it worked out. what zone are you in? I'm in zone 6 (A I think) and mid-March is my target date also, for getting the broccoli in the ground. Course it varies a bit depending on how the weather cooperates. I'm right on the border of 6a, so some years (probably like this one) we tend to be colder than others. I have a May 1st frost free date but last year we had frost problems until late May. So this year I planned most of my crops for May 15th frost free. I'm going to be a little late starting my broccoli since I'm away until next week. I was looking at your thread on broccoli plants and I'll be about a month behind your schedule. When "up potting" are you using more of a potting soil or the same starter mixture? Last year we started our seeds in the 3.5" pots and didn't transplant into any other container until they went into the ground. We did this because it seemed we were constantly "up potting" something and wanted to eliminate some of the rework. But I'm wondering if everyone's using more of a potting soil when up potting if I'm hurting the little guys because they are staying in the starting mixture???? When I say up-potting, that is to the 3.5" pots. They stay in those until they go in the ground. 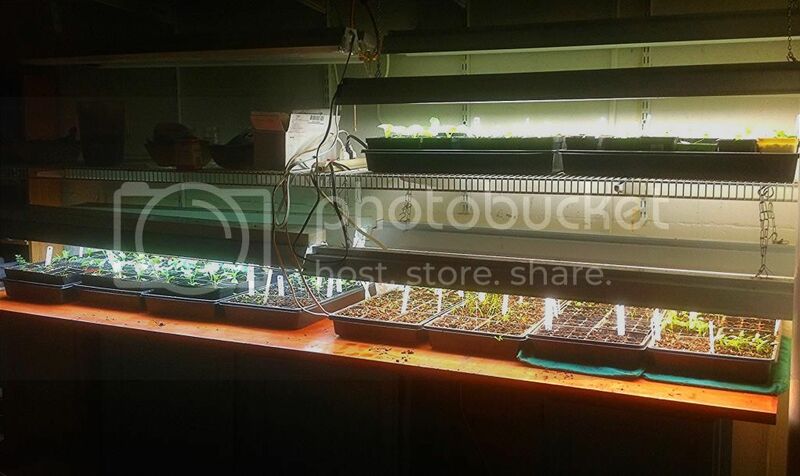 So I start seeds in this, very crowded in little cells to conserve space, especially space on the heat mats. Once they have true leaves, they are moved to one per cell. When they outgrow that, they are moved to the 3.5" pots where they stay. I saved the spreadsheet as a PDF and then I took a "screen" print (picture) of each one. Then I used the attachment function in the Forum to browse for them on my computer and posted them. It took me awhile to figure it out because the Forum wouldn't accept spreadsheet; then I tried the PDF and that wouldn't work; then I discovered the capability of screen printing in my PDF preview software. I have a MACAIR laptop that I'm working from but I know that there is a screen print software for Microsoft products as well. I need to rethink my potting process. Thanks! I finally moved out some plants that have been on the bench since November and have some space. Now, I can pot up the kale seedlings. I started pulling the broccoli out to plant out the lettuce and pak choy. I am still getting side shoots from the rest of the broccoli. Pak choi and Romaine are harvestable. The meyer lemon is flowering now. Unfortunately with all of the rain, the weeds are monsters too. I am going to have to weed whack soon. Yesterday, I planted a bun long taro (Chinese taro) and mioga. The mioga is still dormant but should be coming up in the next couple of months. Now that I have temporarily more room on the bench I can start more seeds of green onions, nasturtiums, cilantro, parsley, lettuce, spinach, and more pak choi. The night temperatures are still in the 60's and it is still raining every few days so I will have to wait a little while more before I plant the peppers. rainbowgardener wrote: When I say up-potting, that is to the 3.5" pots. They stay in those until they go in the ground. Hey Rainbowgqrdener, I'm going to take this opportunity to ask you for more details of your technique/method. Little Cells -- are these tray inserts? How many cells per 1020 tray? How deep? When you uppot to one per cell (presumably same size), do you wait until the seedlings fill the cells so they pop out relatively easily or do you dig them out with some tool? I second the request for more specific details. I was just discussing this with my spouse and asking a lot of the same questions so I logged on to ask and saw Applestar's request. They are tray inserts. They come in various numbers of cells per tray, but I mostly use the 72 cell ones. They are about 2 1/2" deep, basically the same as the trays. Since I am separating a whole bunch of seedlings per cell into one per cell (same size cells), I usually dig them out, since often I am leaving some behind. If you are transplanting all of them at once, you could probably pop the whole cell contents out and then tease the seedlings apart. The "tool" I use to dig them out is whatever is handy, most often the plastic plant tag/label sticks, because they are sitting around by where I am working. Just insert it straight down, next to the seedling, then lift up from the bottom. As long as you are lifting from the bottom, rather than pulling from the top, you will not damage the seedling. Everything I have planted so far just got moved out to the greenhouse. Then I realized that I left the greenhouse open all night long . At least though it only got to like 52 last night. Now that I have some more space inside I am going to start some other things like petunias today. 10 trays, four of them with things in pots. This coming week we are supposed to be getting warm up and the broccoli, cabbage, and spinach will start coming out and being introduced to sunshine. Maybe cilantro also. 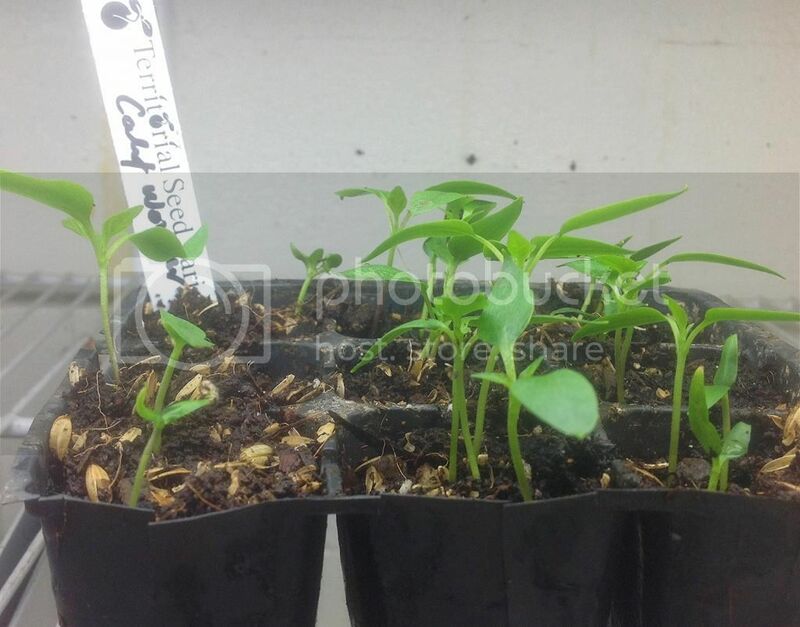 Here's some little bell pepper seedlings. They were planted 1/27, sprouted 2/3. Now they mostly have true leaves. They are still very crowded in the little cells, even though I took the first few (7) out and potted them up.